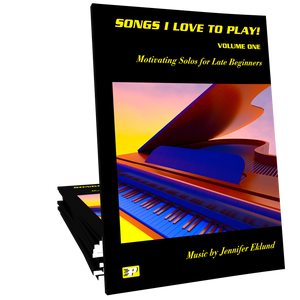 Songs I Love to Play Volume 2 features fun and motivating solos for early intermediates of all ages. 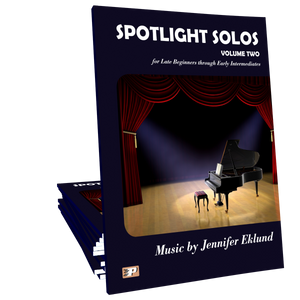 Recital ready arrangements of popular themes and original compositions by Piano Pronto author Jennifer Eklund. This book is included in the NFMC Bulletin for July 2016 - June 2020. 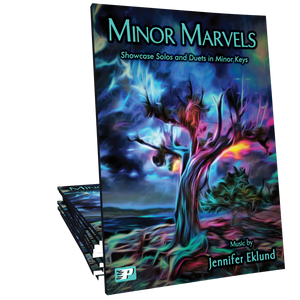 This is a great collection that has a good variety of genres: jazz, ragtime, classical, folk, contemporary. If you have a student who can't decide what style they like, this is a good book to explore. I enjoyed this book and so did my students. One in particular (JP) has been bugging me for “Take Me Out to the Ballgame”. I had been looking for a simpler version but that still sounded full. Found it here. I love the wide range of songs – classical to new age. I am a fan of ragtime and blues so there was something in there for me too! The book does say for late beginners. But I think it might be better suited for intermediate or late beginners who like a challenge and are highly motivated. My sister is also a piano teacher and made the same observation. But because the book does seem to progress, this isn’t a bad thing. The late beginner and the intermediate student will find plenty to keep them playing. Keep up the good work Jennifer! Can’t wait for the next book. I enjoyed playing through this entire book and was secretly thrilled when my student swapped with another student, giving me a few more days to hang onto it before handing it over! We had a blast working on “In the Hall of the Mountain King” during Halloween season. Thanks for all you do Jennifer!